The Polish Revolution cast off the Russian hegemony that had kept the Polish-Lithuanian Commonwealth impotent for most of the eighteenth century. Before being overthrown by the armies of Catherine the Great, the Four Years' Parliament of 1788-92 passed wide-ranging reforms, culminating in Europe's first written constitution on 3 May 1791. In some respects its policies towards the Catholic Church of both rites (Latin and Ruthenian) were more radical than those of Joseph II, and comparable to some of those adopted in the early stages of the French Revolution. Policies included taxation of the Catholic clergy at more than double the rate of the lay nobility, the confiscation of episcopal estates, the equalization of dioceses, and controversial concessions to Orthodoxy. But the monastic clergy escaped almost unscathed. A method of explaining political decisions in a republican polity is developed in order to show how and why the Commonwealth went to the verge of schism with Rome in 1789-90, before drawing back. 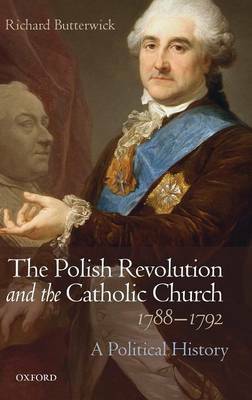 Pope Pius VI could then bless the 'mild revolution' of 3 May 1791, which Poland's clergy and monarch presented to the nobility as a miracle of Divine Providence. The stresses would be eclipsed by dechristianization in France, the dismemberment of the Commonwealth, and subsequent incarnations of unity between the Catholic Church and the Polish nation. Probing both 'high politics' and political culture', Richard Butterwick draws on diplomatic and political correspondence, speeches, pamphlets, sermons, pastoral letters, proclamations, records of local assemblies, and other sources to explore a volatile relationship between altar, throne, and nobility at the end of Europe's Ancien Regime.